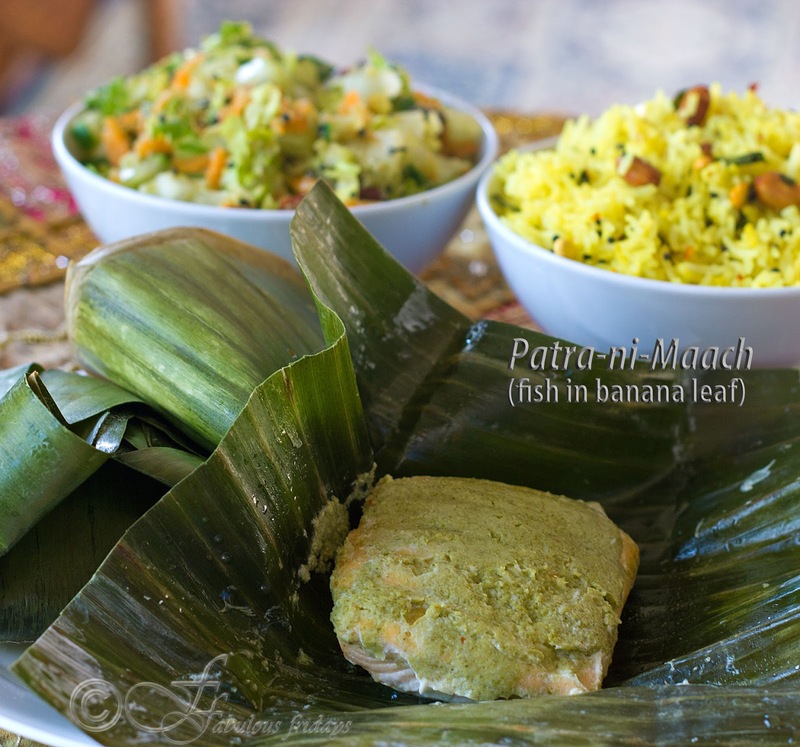 Patra-Ni-Maach literally translates to 'fish in a leaf'. This traditional Parsi delicacy is made with Hilsa variety of fish which is abundant in bones and taste. Pomfret is also used by some. These varieties of fish are not easily available here in Canada, so I use salmon. Seabass works just as beautifully. Fish is marinated in a green marinade (chutney of sorts) made of mint, coriander, and coconut and then wrapped in banana leaves. In the banana leaf, it is cooked in one of three different ways -- steaming, baking or pan frying. You can find banana leaves in Indian and Thai grocery stores. If they are difficult to find, use parchment paper or aluminum foil. Banana leaf locks in the flavor and allows the steam to build up to delicately cook the fish while protecting it from breaking down. When cooked, these parcels go directly from the stove to the plate. Opening a tiny green leaf parcel to reveal a perfectly cooked fragrant and flavorful piece of fish on your plate is really cool and rustic. 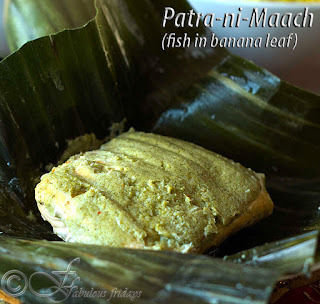 The first time I had patra-ni-maachi in a restaurant, I found it rather charming. Patra-Ni-Maach is made on special occasions such as weddings and is often served over a bed of rice. Here I serve over lemon rice (Nimbekai Chitranna), with a side of crunchy coconut salad that has the same coastal flavor theme and complements the fish wonderfully. The crunchiness of the coconut and peanuts and the tangy sourness of lime juice gives an explosion of textures and flavors together in the mouth. Do try this dish sometimes, it is truly a wonderful experience. Put the first five ingredients in a blender and make a fine paste, almost like a chutney. Smear the chutney all over the salmon fillets and keep aside for 15 minutes. Since the marinade is acidic, any more marination will start to break down the fish. Spread banana leaves (or foil) and place the fish fillets in the center. Wrap these into tiny bundles. If using banana leaves then you can tie the bundles with a string or secure with a toothpick so they don't open while cooking. Steam the fish bundles for 10-15 min till fish is cooked thru. OR bake at 350°F for 10 - 12 minutes making sure you don't overcook, otherwise fish will get tough. You can also stick it under the broiler for 2 min to brown the top, but it's completely optional. 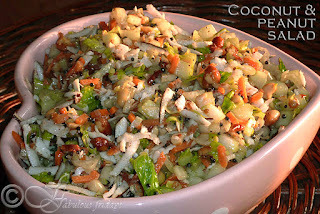 Serve hot in packets for everyone to open with a side of lemon rice and crunchy coconut, peanut salad (recipe follows). In a small pan heat about 2 tablespoons of olive oil and when hot add the mustard seeds. Cover with a lid and remove from heat. the seeds will splatter and make a popping sound. when the sound stops open the lid and add the hot concoction to the salad. Stir well. In the same pan heat a teaspoon of olive oil and stir in the peanuts. roast on medium high for 5 minutes constantly stirring till they impart a nutty aroma. Remove from heat and mix in chaat masala. 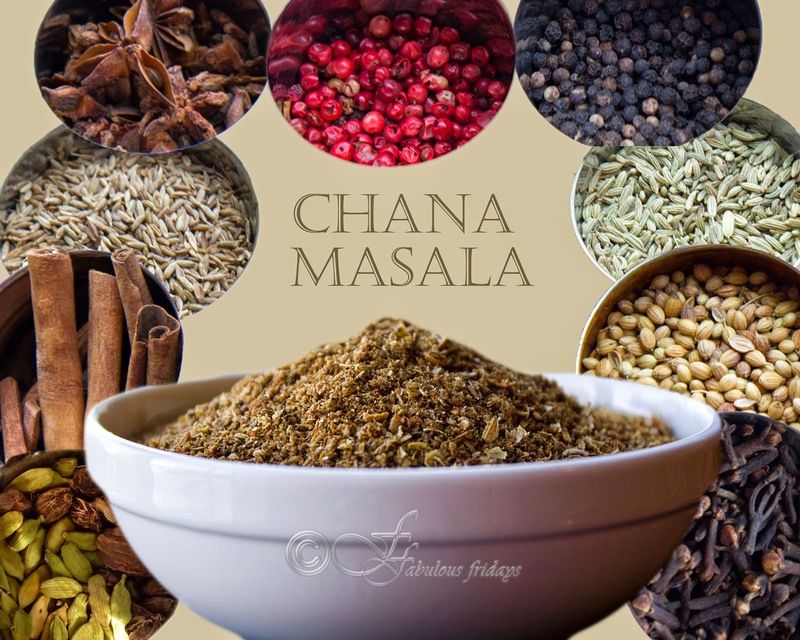 Chaat masala is salty and tangy and available in all Indian grocery stores. I believe it is an acquired taste so use sparingly if you do decide to use it. When ready to serve, add the roasted peanuts, salt to taste and lime juice along with the grated rind into the salad. Stir well and enjoy. Suji ka halwa or semolina pudding is one of the most widely made sweet dish in India as a prasad offering for many religious and auspicious occasions. In the Northern parts of India, we call in 'suji ka halwa' while it's referred to as 'kesari' or 'rava kesari' in the South. 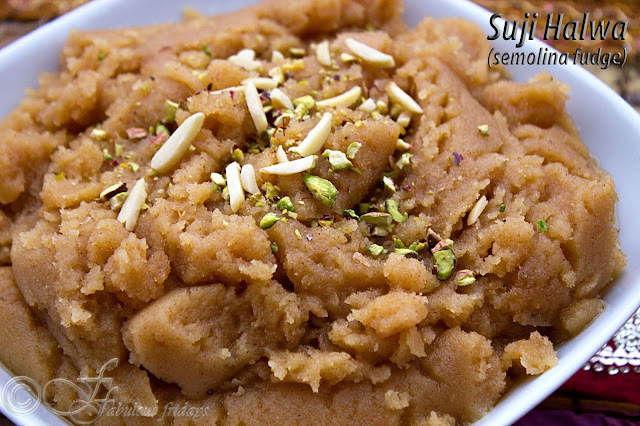 Suji halwa is a must make prasad for Ashtami during the festival of Navratri. It is offered to goddess Durga and then distributed as prasad to all. The procedure to make this dish is very simple and requires very few ingredients. The main skill involved here is the roasting of suji to the right level such that it acquires the lovely golden hue and is well roasted without getting burnt. So always work at a medium heat and you can control the level of roasting. The basic proportion to make suji halwa is suji:ghee:sugar: water - 1:1:1:3. I modify it a bit by substituting 1 cup milk for a cup of water and reducing the quantity of sugar and ghee. You can follow any proportion you like. Mix sugar in the water-milk mixture and heat till sugar dissolves. Add kesar and keep aside. Heat ghee in a pan and add suji. Fry while constantly stirring on medium heat till suji imparts a pleasant roasted aroma and becomes light brown. Stir in chopped almonds and cardamon. Serve hot. A blend of spices, roasted to perfection and then ground coarsely. Use this spice concoction to make choley, black chana, dry matar. This spice blend is quite potent so a little goes a long way. I even use it to flavor some stir fried veggies like beans, eggplant. Take the first nine ingredients and roast them gently in a hot pan for a few minutes till fragrant. Make sure not to over roast. Cool. Grind these with anardana powder and mint to a fine powder. Grilled Tilapia with pinapple salsa on crunchy peanut couscous. Tilapia is a mild flavoured fish. To me tilapia always tastes very earthy and assumes any flavour you add to it. I love to give it very delicate spices and pair it with bold concoction of flavours. Thats why I served this combination of dishes together. The delicate earthiness of tilapia with bold and spicy punch of the pineapple salsa along with the crunch of the peanut couscous really hits the spot. Mix all the ingredients together and marinate the fish for 20 minutes. Grill for 15 minutes till fish turns golden brown and cooks through. 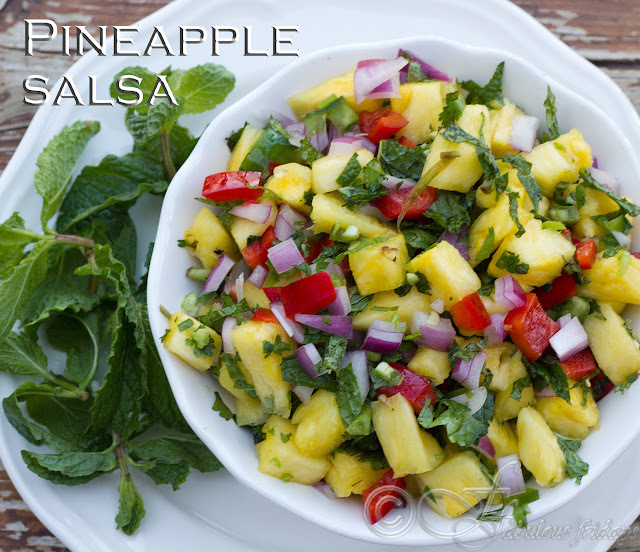 Serve warm with tangy pineapple salsa. Pineapple's firm texture and sweet-sour taste is perfect for salsa. Gives a tropical touch to the meal. Mix all the ingredients together and chill for 2 hours. 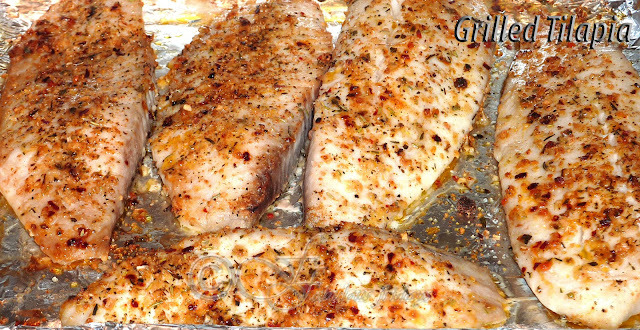 Serve at room temperature over the grilled fish. In a saucepan bring water to boil. Add couscous and salt and turn off the heat. Stir, cover and let stand for 15 minutes. fluff with a fork. In a large pan heat olive oil and stir in the vegetables. Saute for 2 min and remove from heat. Stir in cooked couscous and peanuts and mix well. Flavor with salt and vinegar. Its tomato season here. Produce sections are displaying and selling their beautiful and bountiful tomatoes by the bushel. Seems like a good time to buy freshly harvested tomatoes in bulk and process to preserve for later. If you have Italian origins you're probably familiar with this summer ritual already. Twisting open a bottle of passata or defrosting the prepared pasta sauce in the middle of winter to bring the flavors of summer to your table is one of life's great pleasures. 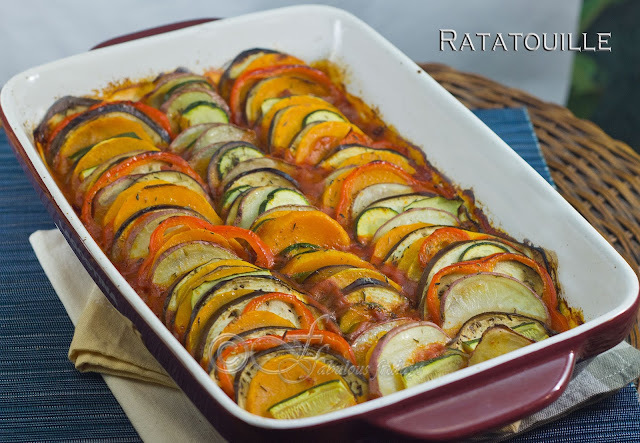 When tomatoes and other produce are in abundance, another dish that is an absolute must make is Ratatouille. For those not familiar with Ratatouille, it is not just an interesting movie. It is a delicious dish with layers of roasted in-season veggies like summer squash, bell peppers, eggplant, and zucchini in a tomato-based sauce. It's healthy, hearty, comes together rather quickly and is an impressive dish to serve. 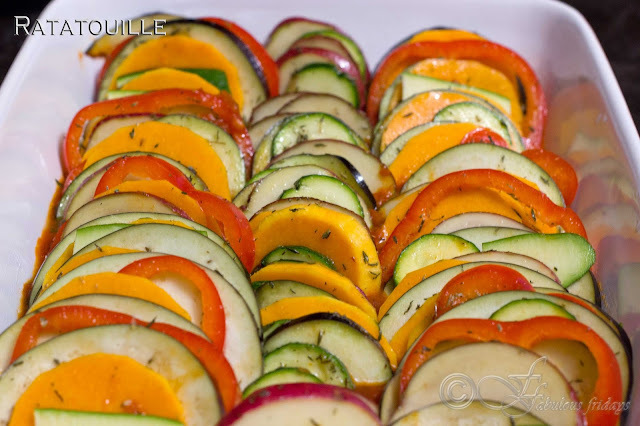 I often use Ratatouille in my Buddha bowls. For the uninitiated, Buddha bowl or macro bowl is a beautiful, colorful and delicious assembly of nutritious food. 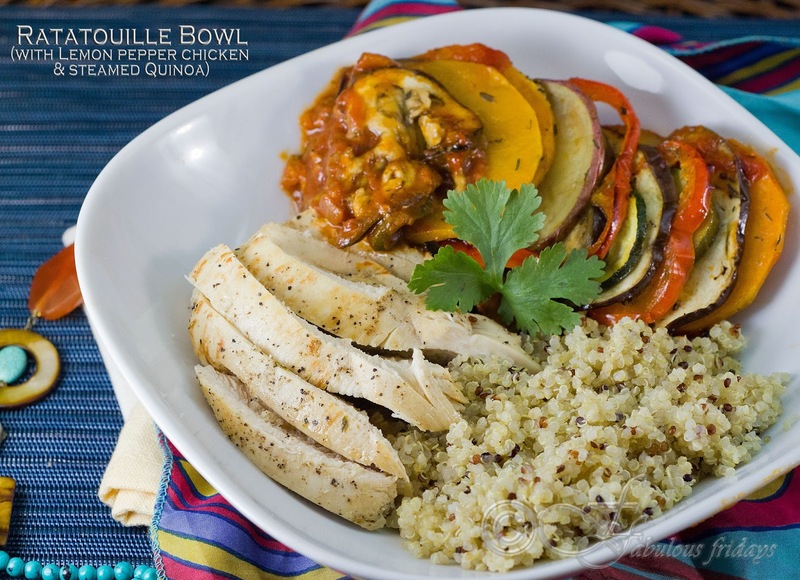 The flavorful tomato-ee Ratatouille combines so well with the nutty steamed quinoa and grilled tangy lemon pepper chicken breast. A popularly favorite meal in my family. Who knew veggies could be so satisfying and pretty. Bon appétit. In a large pan over medium-high heat, sauté onion and garlic till they turn pink. Add tomato purée along with seasoning and thyme and cook until the sauce bubbles up around 5-7 minutes. It should make a thin sauce. Can add a quarter cup of water if it becomes too thick. While the sauce is making preheat the oven to 425 F and grease a large casserole dish. Slice all the veggies keeping uniform thickness all around. This is the key to this dish cooking evenly. You can use a mandolin to slice if you prefer. Pour a bit of olive oil and season the veggies with salt, cracked black pepper and thyme and mix thoroughly to evenly coat them. At the bottom of the casserole dish, pour the tomato sauce and cover the base evenly with it. 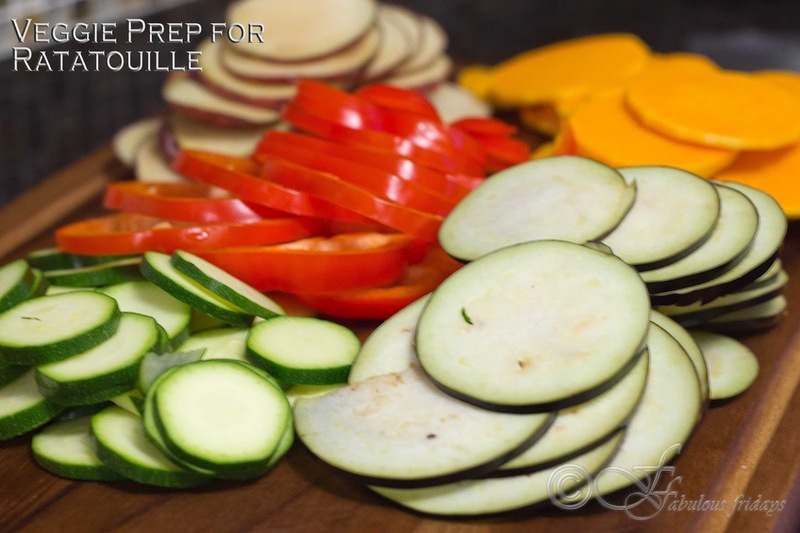 Arrange seasoned veggies the way you see in the picture above. Sprinkle thyme on top. 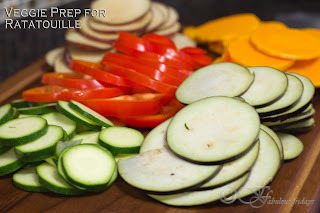 Cover the dish with a parchment paper and bake for 40-45 minutes until all the veggies are cooked. This is a new superfood gaining popularity and can be used in many different recipes. In our family we love its nutty taste and it is a lot lighter in the tummy than rice. Just steamed it with salt to use as a side dish. Simmer and cook covered for 12- 15 minutes till the seeds absorb all the liquid. fluff with a fork and enjoy. Season the boneless skinless chicken breast with salt and pepper. In a separate bowl combine garlic powder, olive oil and lemon juice and rind. Rub this marinade generously on the seasoned chicken. Grill on medium high until lightly golden on top and cooked through in the middle. Remove from heat, cover with foil and rest the meat for 5 minutes before slicing and serving.